[New for 2018] For the most part, most of 2018 ice cream lineup has come out by now and all that's left is waiting for this or that to finally hit your local store shelf. While I keep an eye out on sales of what I haven't covered yet, there's still an opportunity to grab the occasional limited edition flavor here and there. I feel like new limited stuff doesn't quite hit us as much as it used to, but then good ol' budget friendly Hood throws us a flavor from way out in left field. Wow, that's the worst opening shot I've seen in a long time. Ok, that's a little better. 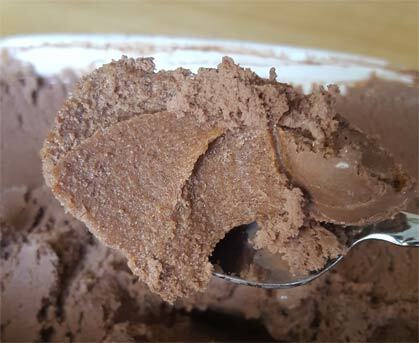 Notice that it has that typical dark chocolate ice cream coloring. Now there is actually swirl to be seen in this shot, but you can't really see it, can you? Look very closely at the center. Do you see it yet? Let me dig it out. 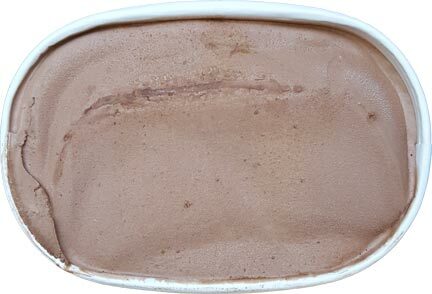 See, this scoop is mostly swirl but you can barely tell the difference between it and the ice cream. Now, do you think I put this scoop in my bowl or in my belly? Yeah, it went in my belly and it's pretty nice. It's not too sugary and it's got just a hint of cinnamon heat. It may not be exactly like the cinnamon crumble on top of a pie, but it's close enough. I officially start my serving and I think the heat is almost more noticeable when you only get a tiny smidge of swirl. Basically the swirl has diffused into the "dark" chocolate ice cream, so there's just a little bit of lingering fireball aftertaste with every bite. That bit of uniqueness is fine, but I think we all came here for the swirl, not the side effects of it. Ok, I got a bit of a bigger swirl finally and it came with a bit more heat. I can now actually feel the gritty swirl in the middle of my scoops and it's adding more of that fireball like heat. It's different, but me being me, I had hoped for more sugary crumble and less heat. Do I have any more thoughts on this budget ice cream? I don't think so. There's always a bit of (skepticism?) going in to these kinds of flavors because you never know where the cinnamon blend will land. Well, now I know and so do you. 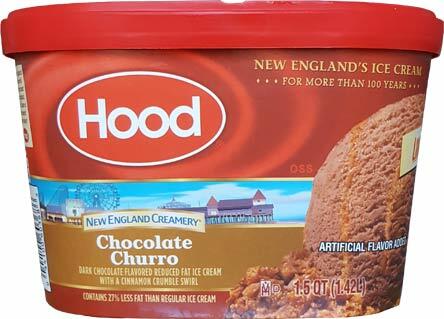 If you live in New England and want a little kick to your chocolate (but not a whole lot of darkness), give this $2.50 a container limited time flavor a try. On Second Scoop: Pro Tip: Don't use this for milkshakes. 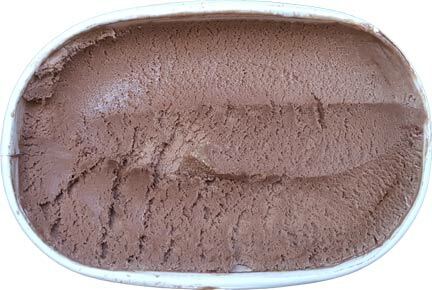 I think this happened once before with another ice cream, but what happens is the milk dilutes the chocolate factor and you are left with something akin to the flavor of what wet cigarettes probably taste like. Thankfully adding a bunch of chocolate back in helped. --- Anyway, jumping ahead, I seem to be losing my appreciate for this flavor every time I try it. It's not straight up terrible, but I guess I just don't get it. It doesn't really accomplish anything remarkable other than having tricked me in to buying it. Hopefully the spicy chocolate crowd will appreciate this one, but the rest of us should probably just keep walking. yeah, even when the swirl is super thick, it bears no resemblance to a churro. It's nice that they are trying but a limited budget only gets you so far. 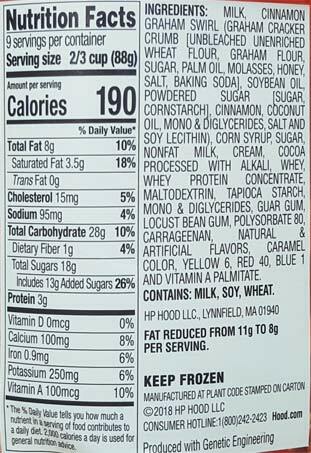 They could had added some churro pieces or even snickerdoodle cookies! Off topic but have you tried any of the flavored Fat Boy I've cream sandwiches? Picked up the Smores and Cookies & Cream this morning. Tried the Smores tonight and I found it slightly sweet but really tasty and the chocolate chips mixed in were a nice change of pace. Looking forward to trying the other one soon! "Something akin to the flavor of what wet cigarettes probably taste like..." Move over all of you Food Network over-emoters. This is the best description ever. Mic drop.